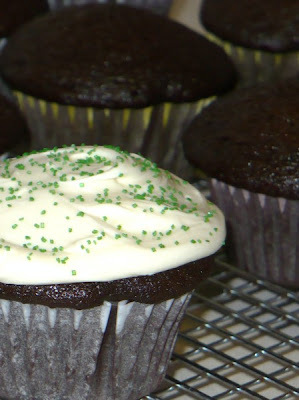 These cupcakes are nice and moist and rich. The full recipe makes 24 cupcakes. You can easily halve it to make a dozen, as I did today. Caralie got to frost most of them and gave them green sprinkles in honor of St. Patrick's Day. I found this recipe on Allrecipes.com. Love that site! The best thing about this recipe is that it contains no eggs so you can lick the batter with abandon. Preheat oven to 350 degrees. Line muffin tins (24 for full recipe, 12 for half). In a large bowl, combine sugar, flour, baking soda, salt, and cocoa powder. Add water, oil, vinegar, and vanilla and stir until smooth. Divide batter into muffin cups. Bake for 18-20 minutes or until tops spring back when touched. Cool completely before frosting. Using an electric mixer, beat butter and vanilla until smooth and creamy. Add sugar slowly (1/2 cup at a time), allowing butter and sugar to cream together before adding more. Add milk 1 tsp. at a time until frosting is at your preferred texture. Add food coloring, if desired. Frost completely cooled cupcakes. Store in an airtight container. Does not require refrigeration.